Paint – looks so good when you add a fresh coat and/or change to a new color. One of the least expensive options in home decorating makes a big difference! But what do you do with extra paint that is left over? Without question, you always have more than needed; it’s just how the quantities work out. In our old circa 1915 home, we have done a lot of painting. And our basement reflects this. When short on time, the extra cans just piled up in the basement. Good that we have a storage room down there; but eventually that gets full too, and then we can’t find anything…. Even with properly labeled cans, you need to be able to locate the one you want within the clutter. So what to do? 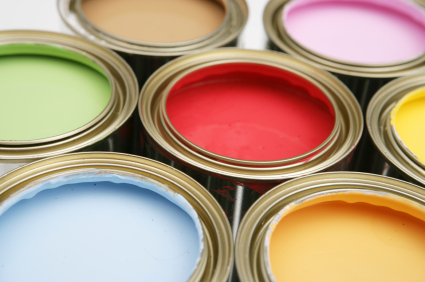 Should you really be holding on to old cans of paint? And if you decide to get rid to them and make room for other things (or simply get around the paint-can-dominated area), how do you responsibly dispose of the old paint? Note that while most of us want to hold on to paint for touch-up purposes, after a couple of years, paint surfaces will fade. In a bright sunny room, the fading is even faster. Thus the color in the can still contains all the pigments, while the color on the wall does not. Even if two painters touch up the same wall at the same time, and use paint from the same can, they are likely to get completely different results. This is due to wicking, or how moisture is absorbed into the surface being painted. The rate at which wicking occurs is the controlling factor in the final look of the painted surface. Finally, stored paints can lose moisture, making it more difficult for touch-ups to match the original coat. Now the good news! Computer aided matching technologies have made it much easier and more precise to match older paint colors; this eliminates the need to buy more paint than necessary for fear you won’t be able to match the color later. All you need to do is chip off a small piece of old paint from the wall color that you want to match. This can easily be done with a utility knife or a razor blade. Take the piece in to your local paint store and they will give you new, matching paint. 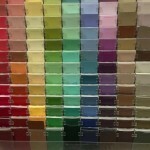 See the Natural Handyman’s article on how to best do paint touch ups, to minimize any color and/or sheen differences. If you have relatively new paint and need to touch up your wall, realize that it will wick at a different rate than the original top coat. Reproducing the exact wicking rates each time you paint is virtually impossible, but you can try to influence it. Diluting paint adds moisture, which slows the wicking rate and increases the time needed for the paint to set up. We recommend diluting latex paint by adding water, in an amount of 5-10% of the paint volume. The above information is attributed to an article in Cleaning & Maintenance Management magazine by Tony Sharotta, a process engineer for Sherwin-Williams. 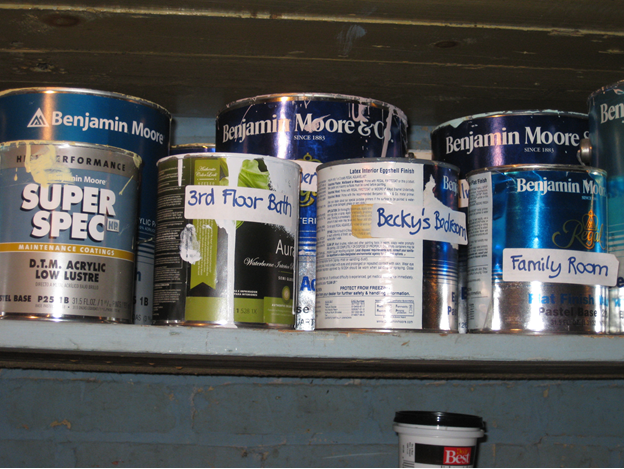 According to Sherwin-William’s website, the key to paint storage is keeping air out of the can. “Before closing the can, carefully wipe paint residue from the groove, or chime, and the rim of the lid. Close the lid with a rubber mallet or place a block of wood on the lid before hammering it shut – a hammer will damage the lid, preventing a good seal. Don’t store paint in direct sunlight, inside a hot attic or garage, or next to something warm such as a water heater or furnace. Heat accelerates deterioration, and UV rays fade pigment. Don’t store paint where freezing temperatures are possible. The freeze-thaw cycle will ruin latex paint. 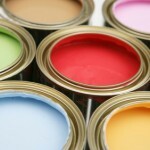 You can dispose of hardened latex paint with your household garbage. However, you must take the following steps so that the paint is solid. Open the can and let it dry out. Depending on the paint volume, this could take a couple of days. To speed up the drying process, add hardening agents such as kitty litter, sawdust or products purchased at your local paint store. SCARCE (School and Community Assistance for Composting and Recycling Education) has an excellent video explaining the process to dispose of paint. Click here for a how-to instructions. Another option is to take used paint to your local hardware store. 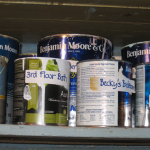 For a fee of approximately $2 to $4 per gallon, many stores will recycle your paint. Earth Paints Collections Systems partners with a number of ACE hardware stores for latex paint recycling. 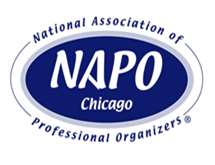 This link provides a listing of recyclers in Illinois. Make sure you call first, as changes occur frequently! If you have several partially filled cans, pour the contents into one can and pay less for disposing of fewer cans. The Public Works Department of DuPage County is currently sponsoring a latex paint recycling program; paint can be dropped of at no charge and no volume limit. Note that this only runs through July 15th. See the county’s flyer for more information. latex paint, paint disposal, paint fading, paint matching.